Are you still just stuck with altering your shirt colour and the denim cut to get the smooth look look? Consider accessorising to amp your style and get the desired dapper look. We said accessories and you're thinking ear studs, rings and chains? You got us wrong and this is so passe. We're talking sharp looks, slamming style and eco-conscious fashion accessories. 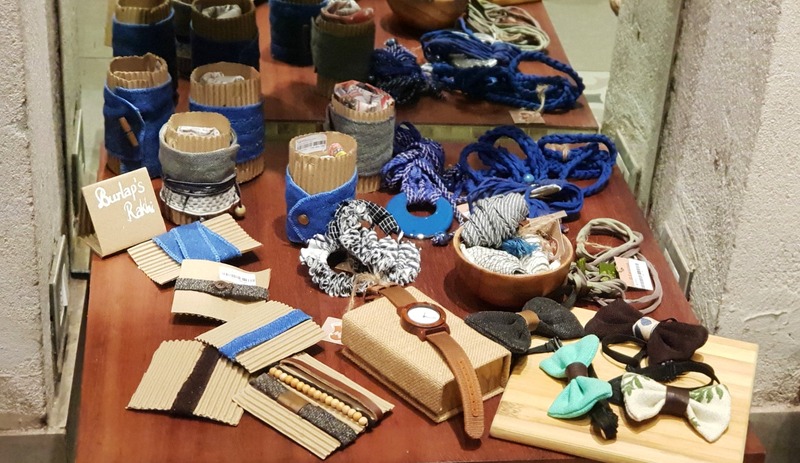 If you want to step up your style game then hit Sienna's concept cafe-store to splurge on some cool fashion accessories that will keep you on top of the look book, no matter the trend the season's catching up on. Transform a simple shirt-and-trouser look with Sienna's block-printed cotton bow ties (these are upcycled from leftover cloth materials) or with the pop colour jute ones from The Burlap People. For a snazzy day attire try Sienna upcycled silk ties that come in beautiful muted colours and with natty designs. But if you're too fussy to wear things around your neck, then try some smart wrist bands made of jute, beads, cotton and leather. Try the broad jute ones that fit as a cuff or play around with several trim bands. Or keep it neat with a wooden watch from Tribe (watches made of wood and sturdy fabric) that's available in the store. Prices of these start at INR 550. Sienna is also stocking a fantastic collection of colourful men's wallets from The Burlap People. Red, yellow, rust, olive--there are plenty colours to choose from, and these wallets can do just as much to perfect your look as will the accessories.